Imitation bear teeth that are very realistic looking but do not have the smooth enamel finish of a real tooth. Great for necklaces and other projects. 3.50 inches long. These are cast from a composite material and are not plastic. The original mold was made using an actual bear tooth as the form. Each is hand-cast and plainted. These drill easily and cleanly for projects where the tooth is strung. This item combines with other imitation claws for quantity pricing. Made in the USA by a Native American owned company. Imitation grizzly claws that are quite nice and very life-like looking. The finish is a dark chocolate brown color. Claws are measured on the outside curve. 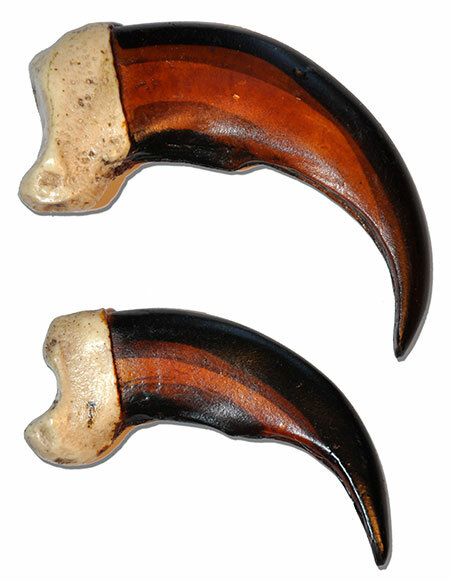 The large claw is 5 inches and the medium claw is 4 inches. These are cast from a composite material and are not plastic. The original mold was made using an actual grizzly claws as the form. Each is hand-cast and plainted, so there may be some color variation. These drill easily and cleanly for projects where the claw is strung. This item combines with other imitation claws for quantity pricing. Made in the USA by a Native American owned company. A great reproduction for kids projects or where low cost is important. Cast in heavy weight plastic. Approximately 3 inches across (4 inches measured on the curve) and has a hole for easy stringing.